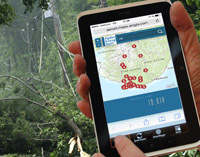 More than 120,000 people accessed Agder Energi's real-time outage map during and just after Hurricane Nina hit Norway. The outage map lets media and customers view real-time SCADA data on an Esri-powered map. Redlands, California—When Hurricane Nina hit southern Norway last month, more than 20,000 customers lost power but were not in the dark when it came to having information. During and after the storm Agder Energi, Norway's third-largest electric utility, provided a live web map showing real-time registered outages and restoration efforts. "Customers were happy because they were being informed," said Kjetil Nymoen, solution manager at Esri partner Powel AS. "The map tells customers that Agder Energi is aware of the power outage and working on restoring the service." The map made media circulation and was accessed by more than 120,000 people during and just after Hurricane Nina. It works by pulling real-time SCADA and network-model data from the utility's distribution management system (DMS), an iAM DMS solution provided by Powel AS. The DMS feeds into a map viewer powered by Esri's ArcGIS Online. Hurricane Nina was the first extreme weather event enabling Agder Energi to test the recently released storm-response map. "Once you see the outage in the map, you know someone is working on it," Nymoen said. "Now, people can find the information they need in real time." Agder Energi Nett is the first Nordic electric utility to deploy Powel's iAM DMS solution and the integrated power outage map based on the Esri platform. The utility supplies more than 188,000 customers annually with 7.8 terawatt hours of primarily hydropower. Over 90,000 of its customers, about 50 percent, were affected by Hurricane Nina. View Agder Energi's outage map at http://avbrudd.aenett.no. Learn more about Esri solutions for energy utilities at esri.com/electric.